The Ramblin' Evil Mushroom (あるくキノコ, Walking Mushroom) is a creature from the Mother series, appearing as an item in Super Smash Bros. Ultimate. The Ramblin' Evil Mushroom walks around the stage, waiting for players to pick it up. Should they do so, they can attack with its spores in a manner similar to the Fire Flower's flames. Any fighter hit with its spores has their controls flipped. This is indicated by a small mushroom appearing on the character's head, similar to the Flower effect. 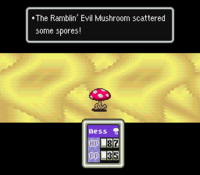 The Ramblin' Evil Mushroom also appears as a Spirit. In addition to the above, equipping the Toadsworth, Grim Leecher or Bellossom Support Spirits will give the player a Ramblin' Evil Mushroom at a start of a match. A Ramblin' Evil Mushroom as it originally appeared in EarthBound scattering spores to inflict Mushroomization. Ramblin' Evil Mushrooms are enemies in EarthBound. The status they can inflict on Ness and his party, Mushroomization, causes a mushroom to sprout on their heads which reverses and rotates their controls on the overworld, which is referenced by their effect in Ultimate. Similar variants of this enemy appear in both EarthBound as well as Mother 3. Snake crouching next to a Ramblin' Evil Mushroom. This page was last edited on February 21, 2019, at 11:06.